Is a recruiting aid in that it is a foundation for developing interview questions and details information about the position that can be incorporated into “help wanted” ads. Provides a basis for employee reviews, salary increases, setting goals, and growth paths. Serves as legal documentation that can be useful in the event an employee files a termination or discrimination lawsuit against the company. The job descriptions contained within the Internet and Information Technology Position Descriptions HandiGuide® are all in a standard format and are available as in PDF and WORD .docx formats. All of the job descriptions were reviewed and updated to comply with Sarbanes-Oxley and the ISO 27000 security standard. The latest version of the HandiGuide was completed in and is over 750 pages in length. 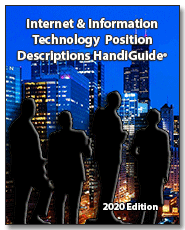 The Internet and IT Position Descriptions HandiGuide includes sample organization charts, a job progression matrix, and the 281 Job Descriptions Descriptions. The book also addresses Fair Labor Standards, Sexual Harassment, the ADA, and is in a new easier to read format. A SPECIAL BONUS for those of you who purchase both the HandiGuide and the WORD files - if you provide us with up to five (5) completed Position Description Questionnaires within 30 days of purchase, we will create 5 position descriptions for you and provide you with 24 months of free update service for the HandiGuide and all job descriptions that we update and create. Manager Accounting for Information Technology, Manager Administration and Facilities, Manager Application Development, Manager Applications, Manager Application Technology, Manager Availability/Automated Operations, Manager Business Development, Manager BYOD Support, Manager Change Control, Manager Cloud Applications, Manager Competitive Intelligence, Manager Computer Operations, Manager Contracts and Pricing, Manager Controller, Manager Customer Service, Manager Customer Service Center, Manager Customer Site Support, Manager Data and Systems Engineering, Manager Data Communications, Manager Data Security, Manager Data Warehouse, Manager Database, Manager Disaster Recovery, Manager Disaster Recovery and Business Continuity, Manager Enterprise Architecture, Manager Facility and Equipment Support, Manager Help Desk Support, Manager Human Resources, Manager Information Architecture, Manager Internet - Intranet Activities, Manager Internet Systems, Manager ISO Implementation, Manager Media Library Support, Manager Metrics, Manager Microcomputer Technology, Manager Network and Computing Services, Manager Network Services, Manager Office Automation Applications, Manager Operating Systems Production, Manager Operations Support, Manager Output Processing, Manager Outsourcing, Manager Payroll System, Manager Personal Computing and Office Automation Support, Manager Planning and Integration Services, Manager Point of Sale, Manager Production Services, Manager Production Support, Manager Property Management, Manager Quality Control, Manager Record Administrator, Manager Re-engineering, Manager Safety Program, Manager Sarbanes-Oxley Compliance, Manager Security and Workstations, Manager Service Level Reporting, Manager Site/Shift Operations, Manager Site Management, Manager Site Software/Device Services, Manager Software Engineering, Manager Store Systems, Manager Systems Software, Manager Systems And Programming, Manager Technical Services, Manager Telecommunications Installation and Maintenance, Manager Telephone and Wireless Services, Manager Training and Documentation, Manager Transaction Processing, Manager User Support, Manager Vendor Management, Manager Video and Website Content, Manager Voice and Data Communications, Manager Voice/Wireless Communications, Manager Waste Management, Manager Web Content, and Manager Wireless Systems. Accounting Supervisor, Assistant Controller, Capacity Planning Supervisor, Change Control Supervisor, Contract Management Administrator, Communications Administrator, Computer Operations Assistant Manager, Computer Operations Assistant Supervisor, Computer Operations Shift Manager, Computer Operations Shift Supervisor, Customer Service Coordinator Lead, Customer Service Supervisor, Data Communications Assistant Manager, Data Entry Supervisor, Database Administrator, Desktop BYOD Support Supervisor, Disaster Recovery/Special Projects Supervisor, Hardware Installation Supervisor, Information Center Manager, Microcomputer Support Supervisor, Network Services Supervisor, PCI-DSS Administrator, Procurement Administrator, Production Services Supervisor, Project Manager Applications, Project Manager Distributed Systems, Project Manager Enterprise Architecture, Project Manager Enterprise Resource Planning (ERP), Project Manager - Implementation Deployment, Project Manager Network Technical Services, Project Manager Systems, Project Manager – Training, Record Management Coordinator, Supervisor POS, Supervisor POS Training, Supervisor Safety Program, System Administrator, System Administrator – Lead, System Administrator – LINUX, System Administrator – UNIX, System Administrator – Windows, Voice Communications Manager, Waste Management Coordinator, Webmaster, and Word Processing Supervisor. 4th GL Specialist, 4th GL Specialist Senior, Account Representative, Accountant, Accounting Analyst, Accounts Payable Clerk, Administrative Assistant, Audio Visual Technician, Business Analyst, Business Services Analyst, BYOD Support Specialist, Change Control Analyst, Cloud Computing Architect, Competitive Intelligence Analyst, Computer Equipment/Network Analyst, Computer Operator Junior, Computer Operator, Computer Operator Lead, Customer Account Manager, Customer Service Coordinator, Data Analyst, Data Center Facility Administrator, Data Entry Clerk, Data Security Administrator, Database Specialist, Desktop Specialist, Desktop Technician, Disaster Recovery Coordinator, E-Commerce Specialist, Enterprise Architect, Enterprise Resource Planning (ERP) Architect, Enterprise Resource Management (ERP) Business Analyst, Enterprise Resource Planning (ERP) Data Architect, Enterprise Resource Management (ERP) Decision Support Analyst, Enterprise Resource Planning (ERP) – Developer, Enterprise Resource Planning (ERP) Functional Lead, Enterprise Resource Planning (ERP) Infrastructure Administrator, Enterprise Resource Planning (ERP) Master Data Analyst, Enterprise Resource Planning (ERP) Process Owner, Enterprise Resource Planning (ERP) Security Administrator, Enterprise Resource Planning (ERP) Security Analyst, Enterprise Resource Management (ERP) Subject Matter Expert, Enterprise Resource Planning (ERP) Team Lead, Enterprise Resource Planning (ERP) Technical Lead, Enterprise Resource Planning (ERP) Trainer, Executive Secretary, Forms and Graphics Designer, Hardware Installation Coordinator, Help Desk Analyst, Help Desk Technician, Human Resources Generalist, Human Resources Specialist, Internet Developer, Internet/Intranet Administrator, Information Technology Associate, IT Planning Analyst, Key Performance Indicator Analyst, LAN Applications Support Analyst, Librarian, Maintenance Contract Administrator, Media Librarian, Metrics Measurement Analyst, Network Administrator, Network Control Analyst Assistant, Network Control Analyst, Network Engineer, Network Security Analyst, Network Services Administrator, Network Specialist, Network Technician, Network Specialist Senior, Object Programmer, Object Programmer Senior, On-Line Transaction Processing Analyst, Operations Analyst, Operations Analyst Senior, Operations Training Coordinator, Pandemic Coordinator, PCI-DSS Coordinator, Personal Computer Specialist, Planning Integration and Control Administrator, POS Coordinator, POS Hardware Coordinator, POS Senior Coordinator, Print Operator, Procurement Assistant, Procurement Coordinator, Production Control Analyst, Production Control Analyst Senior, Production Control Specialist, Programmer/Analyst, Programmer Assistant, Programmer, Programmer Senior, Quality Measurement Analyst, Software Engineer, Software Quality Control Tester, Staff Accountant, Systems Analyst, Systems Analyst Senior, Systems Integrator, Systems Programmer, Systems Programmer Senior, Systems Support Specialist, Systems Support Specialist Senior, Tape Librarian, Technical Services Specialist, Technical Specialist, Technical Specialist Senior, Telecommunications Technician, UNIX Programmer, UNIX Programmer Senior, Voice Communications Coordinator, Voice Communications Specialist, Voice Wireless Communications Coordinator, Web Analyst, Web Site Designer, Web SEO Analyst, Wireless Coordinator, Word Processing Operator, and Word Processing Lead Operator.